Twenty minutes before the start of the 41st annual ING New York City Marathon on November 6, runners were lined up neatly at the starting line, having risen before dawn, taken ferries and buses to Staten Island, and been herded from corral to corral for roughly two hours. Contrast that with the scene twenty minutes before the scheduled start of the first-ever Brooklyn Marathon yesterday: Runners were milling around Prospect Park’s Center Drive when race organizer Steve Lastoe grabbed a megaphone and made an announcement: “I think we’re going to push the start back a few minutes and let everybody go to the bathroom,” he said. “Is everybody cool with that?” Safe to say, the Brooklyn race’s inaugural running was a decidedly less ceremonious affair. The citywide race two weeks earlier had a course that visited all five boroughs and boasted a field of 47,000 runners, including the Kenyan-born holder of the fastest marathon time in history. Brooklyn, meanwhile, had six full laps of Prospect Park plus three partial ones. 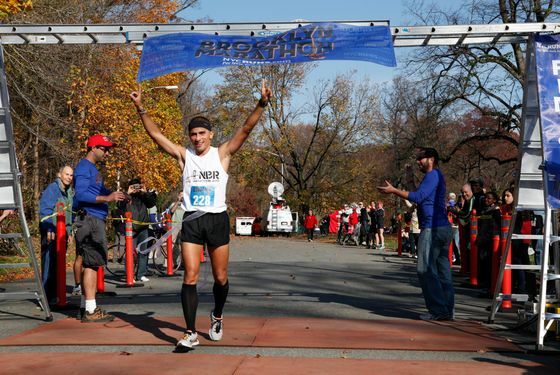 Some Brooklyn Marathon participants said they came out of curiosity; others, civic pride. But none of the 400 runners were there for the prize money. After all, there wasn't any. As racers drifted to the starting line, last-minute instructions included a warning to watch for bikes, cars, babies, and strollers. An air horn blew and the runners took off, leaving behind a small cluster of spectators. A volunteer cleared horse manure off the road with a piece of cardboard. Meanwhile, City Council members Letitia James and Brad Lander worked the crowd. Both said they hoped future years’ marathons could get the permits necessary to leave the park, though overtime pay for police is a stumbling block. Still, James said, her ideal course would pass through a diverse assortment of neighborhoods. “Down Flatbush Avenue – how about that?” she said.